ASP Sentry Telescopic Baton is the best bang for your buck from ASP Tactical Gear. It uses steel more similar to that of the competition but at a much lower price. Designed with the security professional in mind, the ASP Sentry 16" Friction Loc Baton offers a moderately priced alternative to the ASP Friction Loc 4140 batons and features 4130 alloy steel shafts with black chrome finish, an overmolded Strike Force Santoprene grip and accepts all ASP attachments. The Sentry friction loc baton will contribute to your personal safety as well, being compact, strong and easy to carry. What are you waiting for? This baton is as strong and fast as any of the competition and costs less with Defensedevices.com discount pricing. Lowest prices allowed by ASP the manufacturer. The Sentry Expandable Baton has an aluminum cap and aluminum base retaining clip. 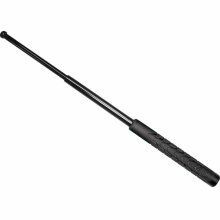 Function of the ASP Sentry 16" Friction Lock Baton is identical to that of the ASP 4140 Friction Loc Batons. Features: * First ASP Security Baton * Friction Loc Series Baton * Overmolded Strike Force Santoprene Grip * 4130 Alloy Steel Tubing * Accepts All ASP Attachments. Great baton for all uses including self defense, security, military and with the longer reach, its better for defense against animals. Weights about 20 oz. Any ASP holster/scabbard designed for its expandable friction lock batons will fit the Sentry line. It may be against the law to own ASP Batons in your state or city. We do not know the law where you live.! It is the purchaser's responsibility to know and abide by the laws in your state and municipality.